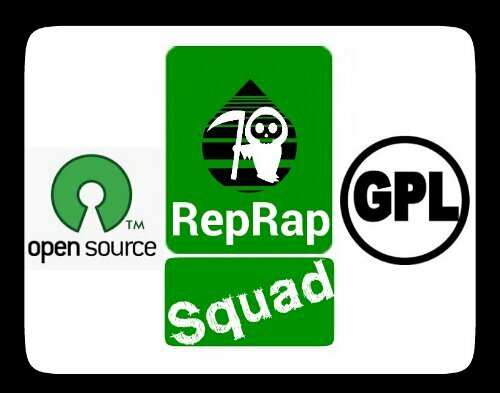 A recent test on several different suppliers as well as filaments has been done by RepRap Squad. If you would like to read about how each one stacked up, click HERE. Polyamide (PA-66) needs a much higher temperature and the same is true for most kinds of Nylon. 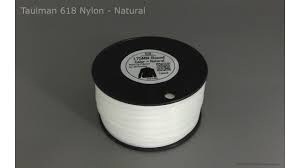 Typically the hot ends used for ABS/PLA can’t generate enough heat for nylon so be careful that you never use nylon in them, it will render it unsusable. Note: The nylon filament will not stick to a glass or aluminum build platform. We recommend covering the build platform with blue painter’s tape for best adhesion. Taulman’s “618” High Strength Nylon Co-Polymer specifically engineered for durability. Color Natural – Prints as a bright natural to white with a translucent surface. Add color with most common clothing dyes. Temperature 235C to 270C – Part/Speed dependent. 240C-250C is best for most parts at average printing speeds. Co-Polymer 4-Station-Drawn and Extruded “3D Printing Specific” Nylon based co-polymer. Specifically designed for 3D Printing applications where excellent surface bonding, reduced water absorption, tear resistance and dye absorption are combined in an easy-to-print 3mm/1.75mm line. With a visual and tactile surface quality 2nd to none. Parts 3D Printed with taulman 618 Nylon co-polymer will be instantly recognizable as high quality polymer. Chemically resistant to Alcohols, Resins+MEK, Oils, Acetone, Most all Alkaline, most 2 part Casting Compounds. A Garolite (Bakelite) printbed is reported by several RepRappers to give good results. This filament can easy be colored with fabric dye. 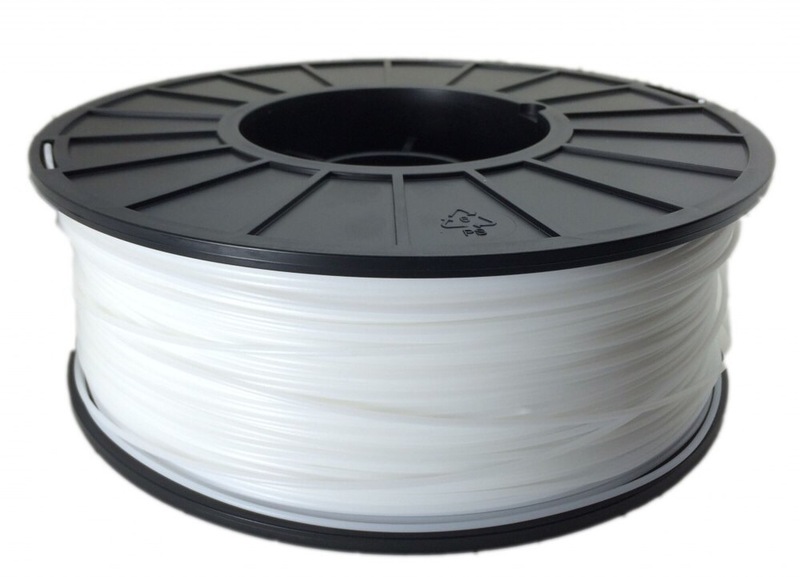 HIPS is a High Impact Polystyrene filament and has an interesting property that makes it particularly well suited as a support material – it is soluble in Limonene (easy to find on Amazon.com). If you have a dual extruder, you can print with ABS and HIPS to create structures impossible to make without support. Then, a soak in Limonene (see above picture, the white portion of that cube in the HIPS and the Black is ABS) dissolves away the HIPS leaving the final part. Prints at about 240 degrees Celsius. 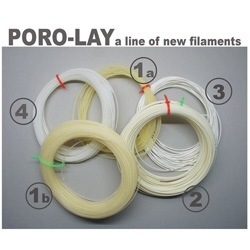 PVA is a lot like HIPS filament. Instead of dissolving in Limonene, it will dissolve in water. Polyvinyl alcohol (PVOH, PVA, or PVAL) is a water-soluble synthetic polymer hydrolysed from polyvinyl acetate. 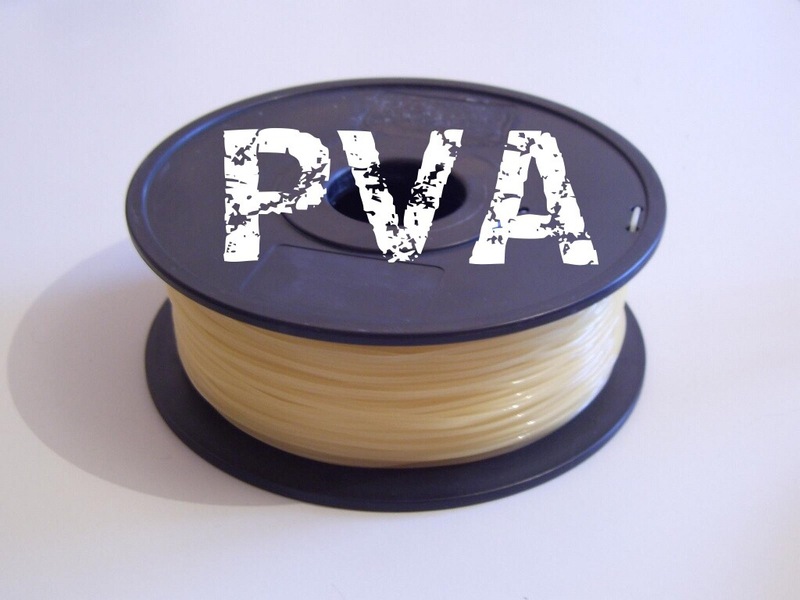 PVA is fully degradable and is a quick dissolver. PVA has a glass transition temperature of around 85°C (185F), but this temperature depends on the polymer’s degree of hydrolysation (ratio of alcohol groups to acetate groups). 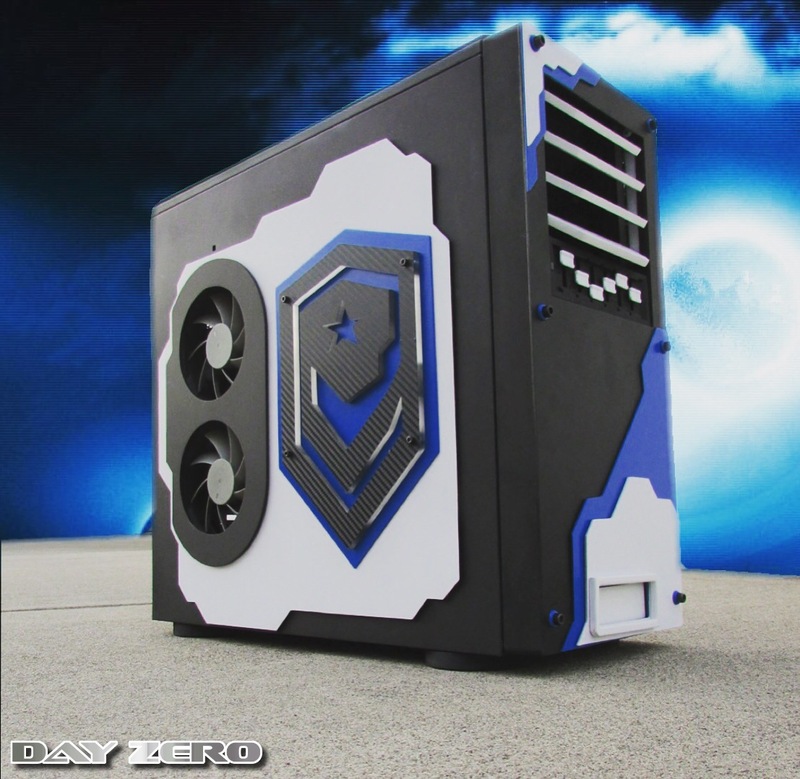 It decomposes rapidly above 200°C as it can undergo pyrolysis at high temperatures. It works great with most dual extruder setups. 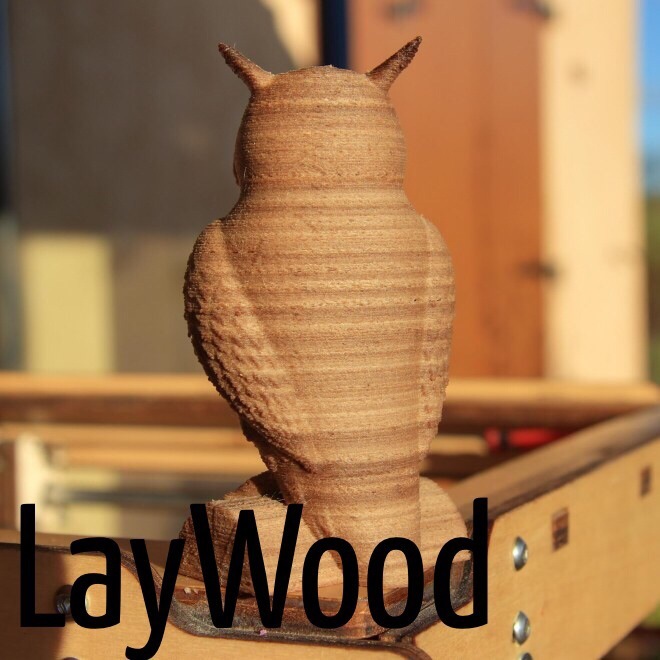 There are several different types of Laywood but they all give an appearance of wood once printed. Typically they are food safe as they usually contain wood fibers. There are programs that can be used to simulate wood grain. Laybrick is the same concept except for a concrete or brick look. They both print around 240 degrees Celsius. Kai explains that LAY-FELT may be used for semi-permeable membranes and filters, artificial paper and “future cloths”. 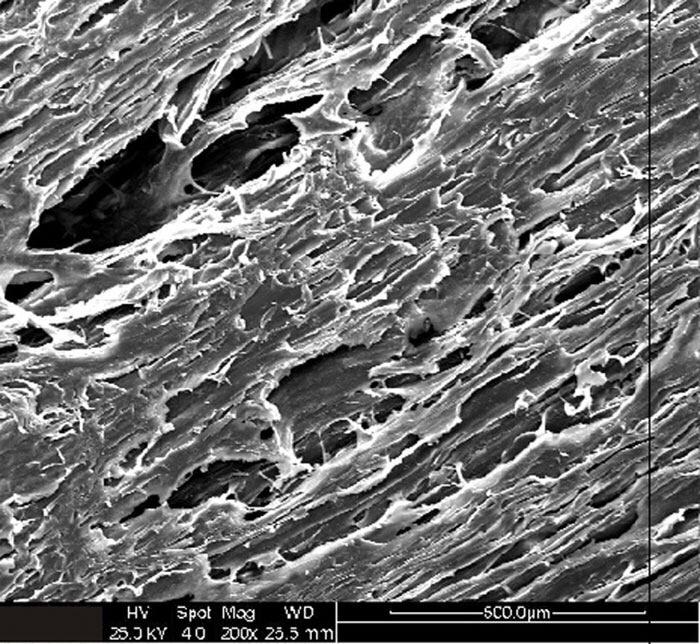 LAY-TEKKKS May also be good for making future cloths, tissue and “orientated” and “stacked” fibrws. LAY-FOMM might be ideal for soft rubber-like applications, such as bendable suits and sponge-like objects, ink-reservoirs, bio-cells, micro-foam and elastics. GEL-LAY can be useful to illustrate biomechanics or as a simulation muscle, particularly as an underwater material. In the above video, Kai uses an octopus as an example of a marine creature whose movement could be demonstrated with this material. This is some neat stuff. It’s fairly easy to print with and it’s great for conducting low voltage. The possibilities are endless. It can be used for anti static, static dissipative, conduction of electric current and screen of electromagnetic interference shielding. 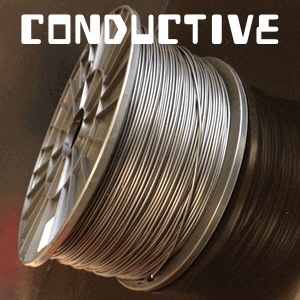 The conductive anti static ABS has advantages with excellent mechanical strength, impact resistance, dimensional stability, high flow creep resistance and excellent heat and low temperature resistance. Prints between 200-230 degrees Celsius. 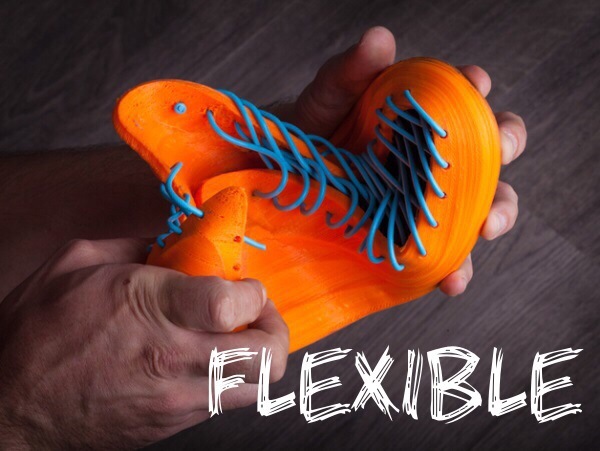 There are lots of different types and brand names for flexible filaments. Typically they are a specially formulated thermoplastic elastomer (TPE) that produces flexible prints with elastic properties. Some brand names include: FilaFlex and Ninja Flex. 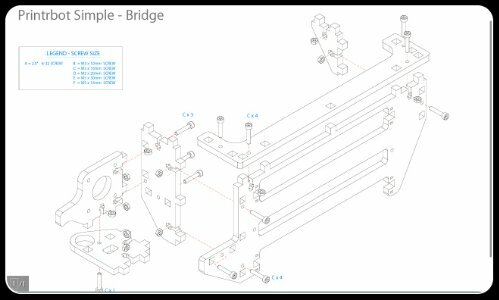 Use of these types of filament typically needs a modified extruder drive system to perform correctly. Most types are not recommended with Bowden setups due to the flexible nature of the filament. 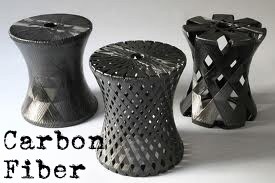 Proto-Pasta Carbon Fiber reinforced PLA with short chopped Carbon Fibers. It is designed to be stiff, or to resist bending. It is the stiffest material most offer and makes parts with an incredibly solid feel. When printed, this material is a dark glossy black that glitters slightly in direct light from the fine chopped fibers reflecting the light. Carbon Fiber Reinforced PLA does not require a heated bed and prints much like unreinforced PLA filament. The main difference is that it is brittle and care must be taken when handling the filament and loading the printer. We have had good results printing at 190C-210C using a .5mm nozzle and direct-drive spring loaded pinch-roll style extrusion head. Layer adhesion is excellent and the material has low warpage. This filament has an opaque anthracite grey colour when the temperature of the material is below 29° C. However, when the material reaches a temperature of 29° C, or above, it will change into a transparent color. It prints at about the same temperature as PLA and comes in a variety of colors. 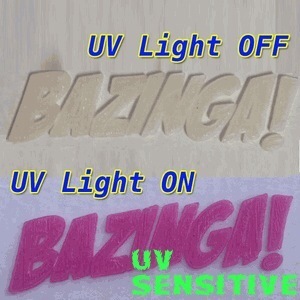 UV filament typically comes in an ABS form. This stuff prints as normal ABS would however, once you expose it to a UV source it changes VERY quickly into a vivid purple color; then once the UV light is removed it changes back into it’s natural state which is a clear / milky clear color. Bed and hotend temps are the same as most ABS filaments. 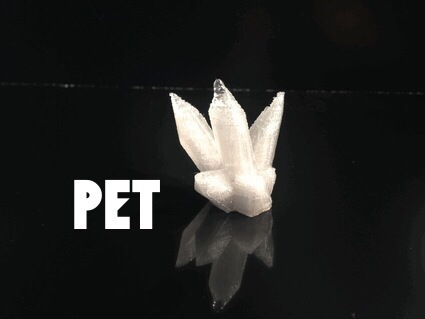 PET is a true transparent filament. PET (also known as PolyEthylene Terephthalate) in its original state is a colourless and crystal clear material. PET is a fairly stiff and very lightweight material, which is very strong and impact-resistant. Most print at about 210 degrees Celsius with the use of a heated bed in the 60 degree Celsius range. 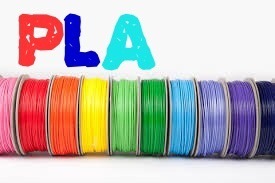 Now there is also flexible PLA, Color changing PLA and Glow in the dark PLA. For the most part they follow the same printer requirements as regular PLA. 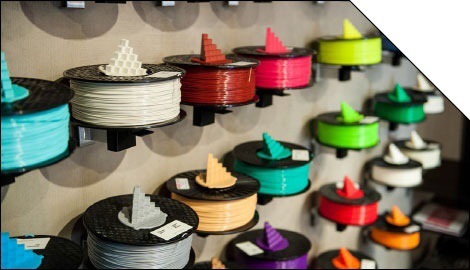 •• Extrudables – U.S. based supplier of filament. Official FilaFlex dealer. 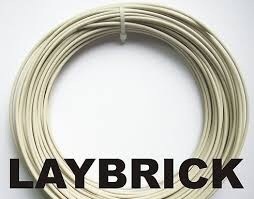 •• PushPlastic – U.S. based supplier of filament. Great customer service. •• MakerGeeks – U.S. based supplier. Quick response to questions. 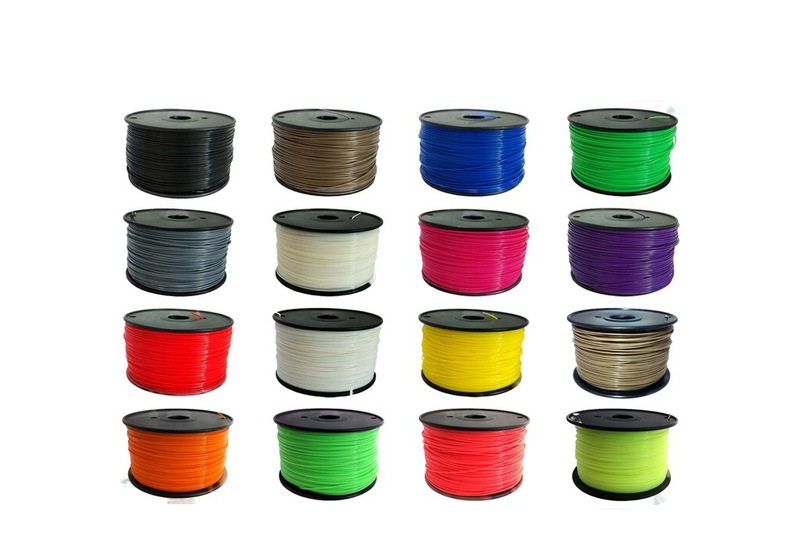 Large selection including exotic filaments. 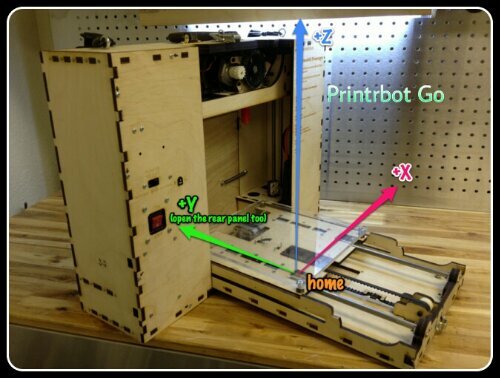 •• Printrbot – U.S. based supplier. Quality filament at a fair price. *While the extruder is cold set the heat to 80c and wait for it to heat up. *When you reach 80c remove the current filament from the extruder. You may be able to back it out by hand or you may need to reverse the extruder. *If you are having trouble removing the filament, increase the temperature to 100c and try again. *Increase the heat and load the new filament normally. *Clean the extruder gear and blow out any particles from the extruder entrance. *Print something that you don’t care if it has bits of the previous color in it, or run the extuder for several minutes. It may take as much as 10 to 15 minutes of extrusion before you can have confidence that there won’t be dark material mixed with lighter material. ABS is the same material that LEGO uses to make their blocks. It is a strong material and reasonably easy to process. Prepare the heatbed with Kapton tape, the ABS sticks to it during printing and releases easy after cooling down. When you use a aluminum heatbed then you can use hairspray (extra strong?) instead of Kapton tape. 2. Use the sandpaper to sand the part as smooth as possible. You won’t be able to eliminate every tiny ridge, but you can get it pretty good. You will probably have to do this by hand as an electric sander can heat up the ABS and ruin the part. 5. Let the acetone evaporate and the part dry. It shouldn’t take long. A Note About ABS – ABS is the material of choice for hard plastic toys. It is also used in children’s toys, drink ware, and other body safe products. A smooth, non-porous ABS part is body safe, but the presence of cracks and crevices can harbor bacterial growth. Be sure your part is smooth and defect free before you use. Thanks again for the great comment. It’s posts like these that keep us going. Our goal is to not just have a blog that shares our experiences but, to make a place where people can come to learn, help and share ideas with each other. I can’t thank you enough for the positive comment. If we can ever help you or anyone else, we’re always available. I think the “high temp PLA” would have deserved a mention. 😉 Otherwise, thanks for the great article. Interesting and user friendly material for novices. Question, how does one modify the shape of filament ends as with filaments used in small brushes? You are providing a real service. Thank you. Tim.